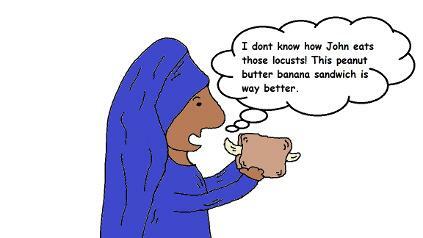 "Elizabeth's Better Than John's Locust Sandwich"
2 Slices Of Bread 1 Banana Peanut Butter (as much as you want) Put your sliced banana with peanut butter on your bread. You can toast the bread if you want it more crunchy! "Ruth and Naomi's Spectacular Morsels"
Melt everything except peanuts in double boiler. Remove from heat. Add peanuts. Put spoonfuls on wax paper. Let cool til firm. Mix it all up. Drop by teaspoonfuls on cookie sheet. Bake 325 degrees for 13-15 min. Mix butter and sugar. Stir in flour and pecans. Dough should be stiff. Press flat in a 15x10x1-inch pan. Cut in 2 inch squares. Bake 20 min at 325 degrees. Melt corn syrup and sugar. Add peanut butter and cereal. Mix it up. Make 1 inch balls. Put on wax paper. Cool. Mix everything together. Drop spoonful of dough on cookie sheet. Bake 10 minutes. EAT! 1 (3oz) pkg. Jello -blue for hail or any other flavor if you don't like blue. Cook until Jello dissolves (not to soft ball stage). Pour over popcorn and make into balls. Beat those egg whites until stiff. Put in sugar and nuts. Pour in tube pan or flat cake pan for 45 minutes at 350 degrees. Combine chips,peanut butter and butter in saucepan. Cook over low heat. Let melt. Remove and pour over chex and stir.Spread out on wax paper. Cool 1 hour. Break in bite size pieces. Mix all together. Put in 8x8 pan. Bake 30 min at 350. Melt butter over low heat in double boiler. Add marshmallows and stir until completely melted. Cook over low heat 3 min stirring constantly. Remove from heat and add cereal and raisins. Stir until well coated. Put in 9x13 inch pan. Cut in squares. Put crackers in single layer in a 15x10x1 inch pan. Boil butter, sugar, and pecans for 2 min. Stir constantly. Spread on graham crackers. Bake 10 min at 350 degrees. "Mary and Josephs late night dessert"
Mix it all up. Make 1 inch balls. Bake for 10 min at 350 degrees. Put graham crackers on cookie sheet and put the chocolate chips and marshmallows on them. Cover with other graham cracker on top. Bake 5 minutes. Mix everything together. Drop by teaspoonful onto cookie sheet. Bake 375 in oven for 5-6 minutes. See more cute bible snack ideas.